Everybody knows about Coq au Vin, but I’m not sure it’s something anyone really makes any more. Well, almost nobody. 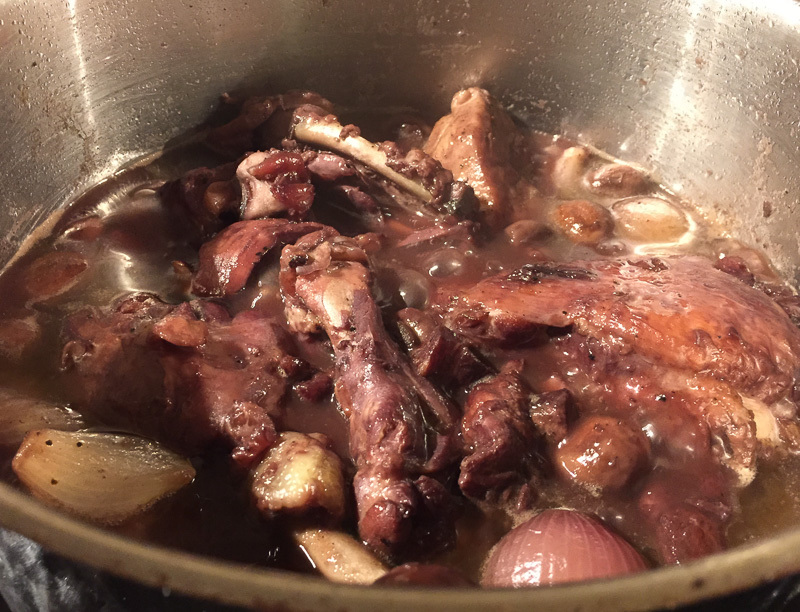 A couple of months ago, my next-door nighbour emailed me asking if The Prawn Cocktail Years recipe for Coq au Vin was any good, as they were thinking of serving it to some friends for dinner. I said it was excellent. I’m not sure I heard back from them afterwards. Maybe it was excellent, as I said, or maybe it was so bad that they didn’t know what to say to me. I guess I ought to make it myself again just to make sure. It all starts with a bottle of red wine. Pour it into a pan with onions, celery, carrots, thyme, bay leaves, garlic and redcurrant jelly, and reduce. OK, pretty straightforward so far. Now for the chicken. I took an “extremely good chicken”, as demanded by the recipe, and jointed it, removing the skin. 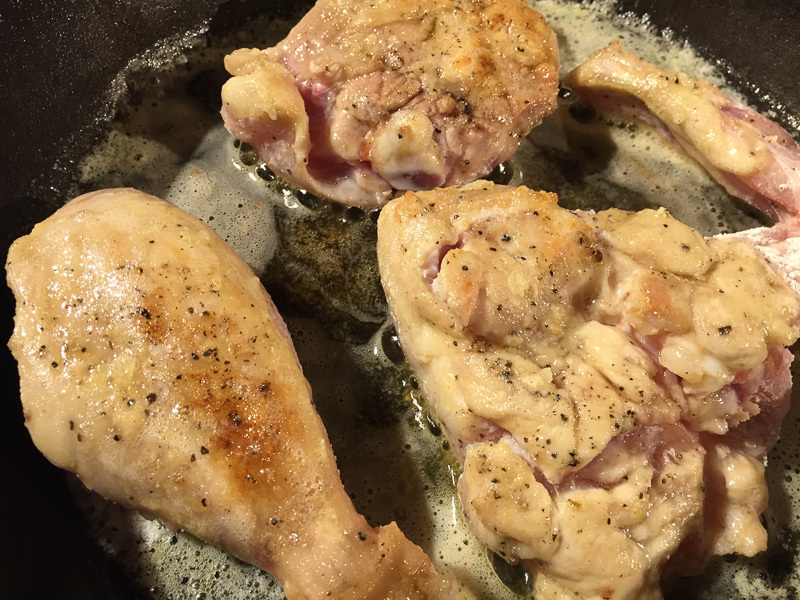 The chicken pieces were seasoned and floured, sautéed until golden brown, then removed from the pan. Next, some pancetta. Now, luckily, I happened to have some home-made pancetta hanging up in the shed (doesn’t everyone?). The recipe said to fry the pancetta in the same fat, but the oil was now full of burnt bits of flour from cooking the chicken. If I continued to use that, it was going to taste awful. 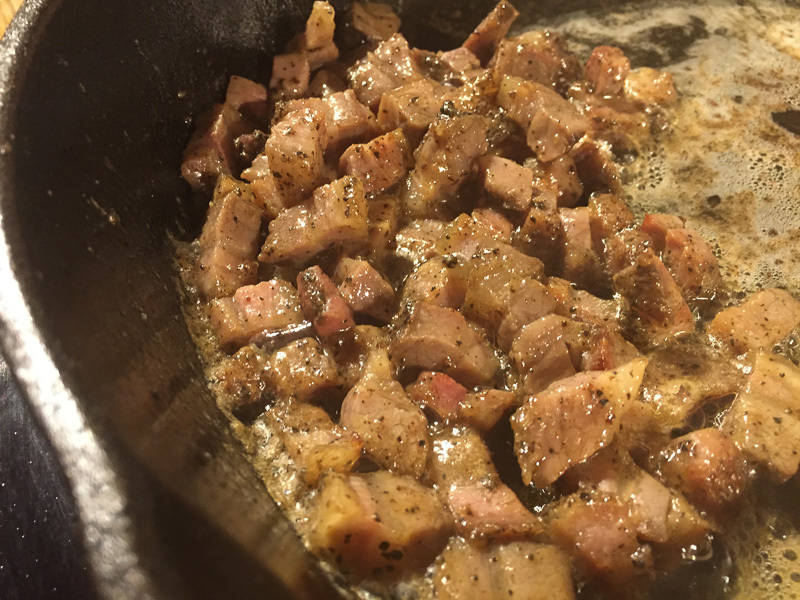 I wiped out the pan and heated up some fresh oil, chopped the pancetta and fried it in the pan until crisp. 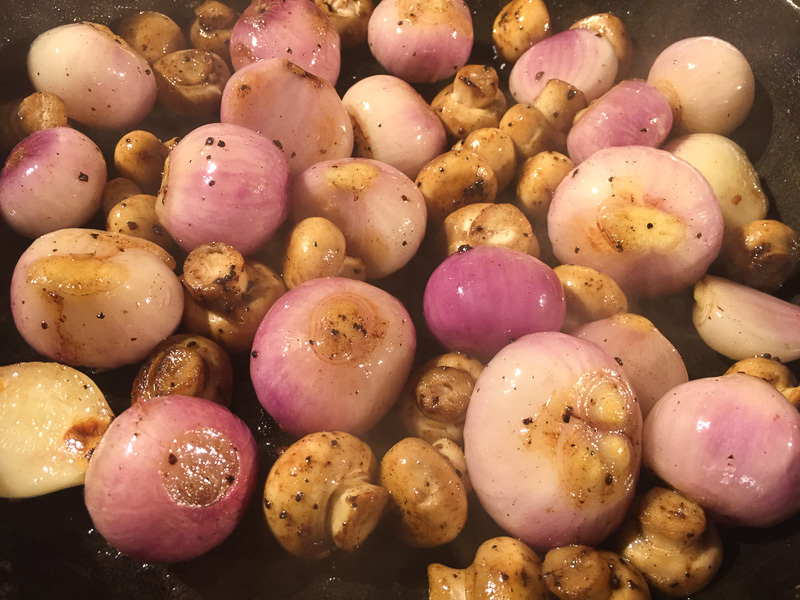 Next, some mushrooms and onions (well, I couldn’t get any button onions, so I use shallots instead. I’m sure the dish was no worse for that substitution). I sautéed those for about ten minutes until well browned. Now the fun bit. I put the chicken, pancetta, onions and shallots into a large pan, poured cognac over it all and set light to it. Finally, I poured over the sieved, reduced wine and left it all to simmer very gently for an hour or so. 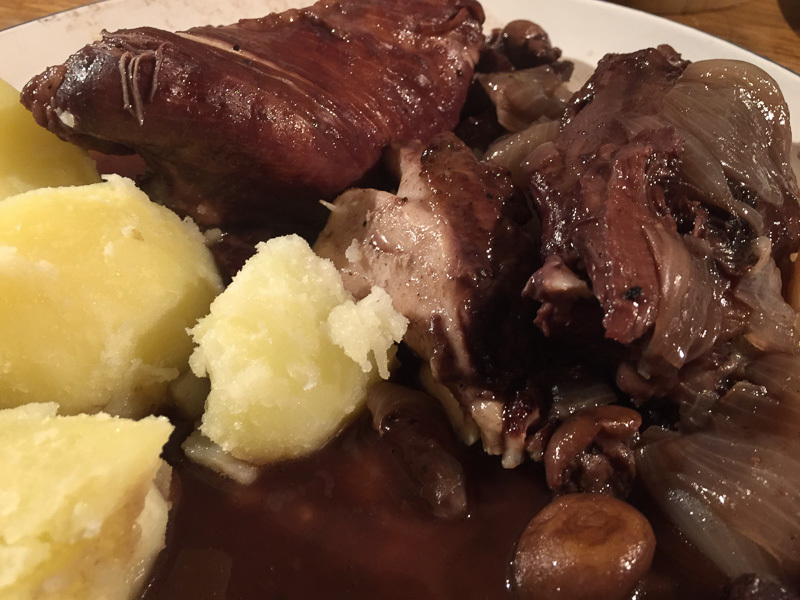 Served with plain, boiled potatoes, as suggested. It was delicious. I’d happily recommend this to anybody. Well! What to say about this delight. I love it. It’s just the perfect blend of flavours. The punchy wine and cognac. The sweet onions, and in this example the beautiful flavour of Dave’s own home cured pancetta. There are seemingly no ends to this chef’s talents these days. There is something wonderful about the rich juices of this dish, mixed with the soft chicken. It’s both delightful flavour on the tongue and soft sensation in the mouth. This dish would go well at a peasant style party, or a posh dinner. It’s versatile and fragrant in any setting. We just have to save up for nice serving oven/stove to table wear. Dave’s idea of plonking the saucepan on the table leaves a little to be desired on the presentation front. Oooh, Dave, I’m going to have to rustle this up. Sounds gorgeous. 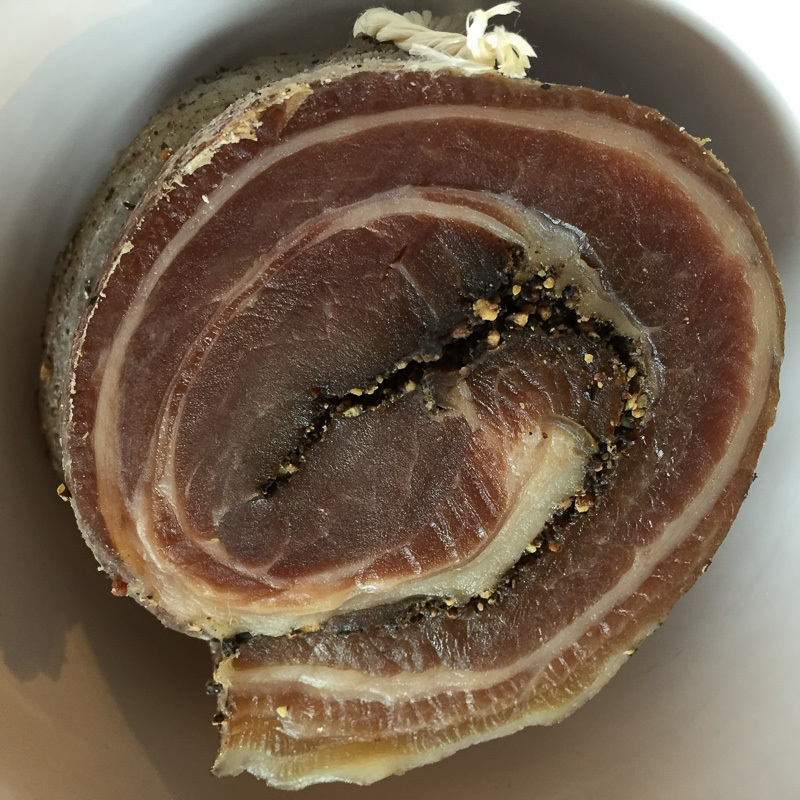 Homemade pancetta eh? You are amazing.